The form you use to obtain this information will use many of the field types described in Chapter 4, "HTML Forms--The Foundation of an Interactive Web." You'll also use a table to make the Figure 7.1. 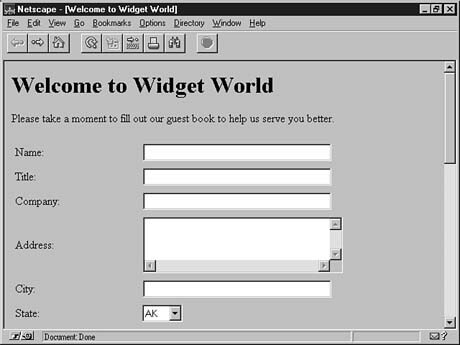 The guest book form as it appears in the browser. fields align nicely. Ultimately, you should end up with a form as shown in Figure 7.1. To display this form, you can use a combination of <TABLE> tags and CGI::Form methods, as in the Perl subroutine in Listing 7.1. Listing 7.1. Perl subroutine for printing the guest book form.